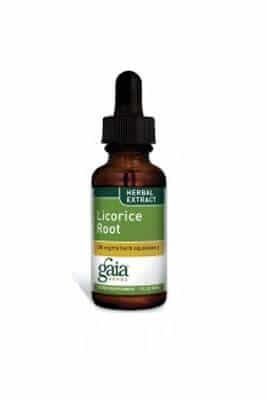 Since 1987, Gaia Herbs has established itself as the leading grower and producer of Certified Organic (COG) herbs and herbal products. Nestled in a pristine mountain valley in Western North Carolina, the Gaia Herb Farm is one of the largest and most productive commercial herb farms in the U.S. Gaia Herbs cultivate over 50 crops on 250 acres that are certified organic by Oregon Tilth. As a vertically integrated company, they control every stage of production from organic soil enrichment programs, seed selection, cultivation, and harvesting, to research and analysis for correct harvest time. 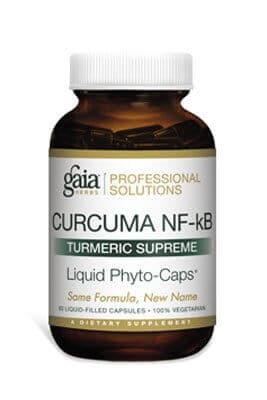 Curcuma NF-kB: Turmeric Supreme Vegetarian Capsules from Gaia Herbs Professional Solutions is a vegetarian product that may possess anti-inflammatory powers. This dietary supplement could exhibit antioxidant powers‚ improve liver and joint health‚ support heart health‚ and protect the brain. Turmeric in this supplement contains a yellow pigment called curcumin and volatile oils. These substances may have the ability to block inflammatory responses in the body. Curcumin may have antioxidant powers and ward off free radicals. In addition‚ it might inhibit NF kappa B‚ a pro-inflammatory agent. It could protect the intestines from inflammation. Curcumin might potentially neutralize free radicals in joints‚ thereby providing relief from joint pain‚ swelling and stiffness. It could protect cellular DNA from damage.